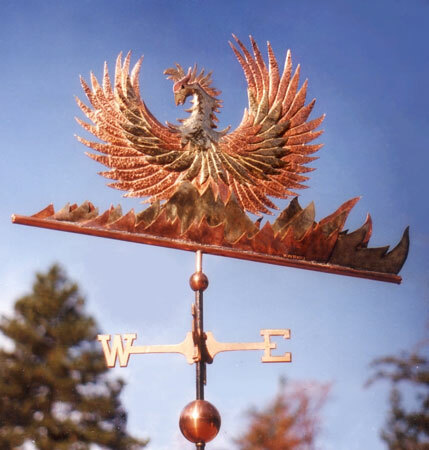 While a finely crafted weathervane will add beauty to your home, it also has the very practical function of informing you about the weather. Interpreting weather vane messages can be both enjoyable and educational. Wind direction is reported by the direction from which it originates. For example, a northerly wind blows from the north to the south. Weathervanes works by moving to minimize air resistance and are designed to turn and point into prevailing winds, indicating the direction from which the wind is blowing. Your specific location may be affected by local conditions, but the following information applies generally to most parts of the Western United States. West winds usually bring fair skies. Easterly winds, caused by the counter clockwise turn of low pressure systems, usually bring storms. East or northeast winds, during the summer or autumn in California, can indicate a “Santa Ana”, which is a hot, dry wind, sometimes gusty and strong. North winds during the winter often herald stormy weather approaching, possibly accompanied by hail or snow. Blowing from colder regions, especially when coming from the northeast, these winds are products of low pressure systems. Southerly winds typically bring warm and humid conditions. A wind from the south usually carries gentle rains, though it can bring more violent weather if it meets with much colder air. Flooding sometimes occurs when a very moist system collides with a cold front depositing “buckets” of rain on the landscape. 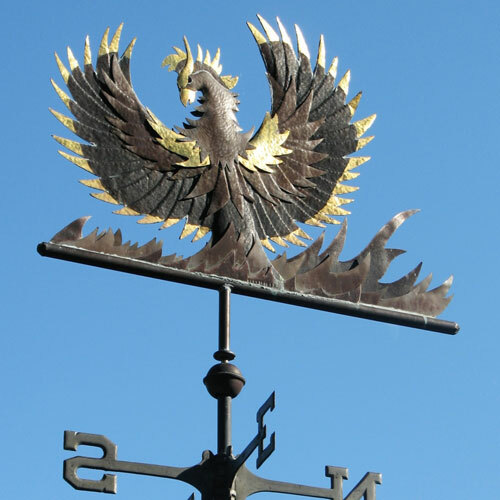 Wherever you live, a West Coast Weather Vane is designed to be functional as well as decorative and, with a little local knowledge, can help you observe and predict weather conditions in your area. We certainly enjoy looking out our window first thing in the morning to see our Phoenix Weathervane silhouetted against the morning sky, faithfully predicting what weather we can anticipate for the coming day.